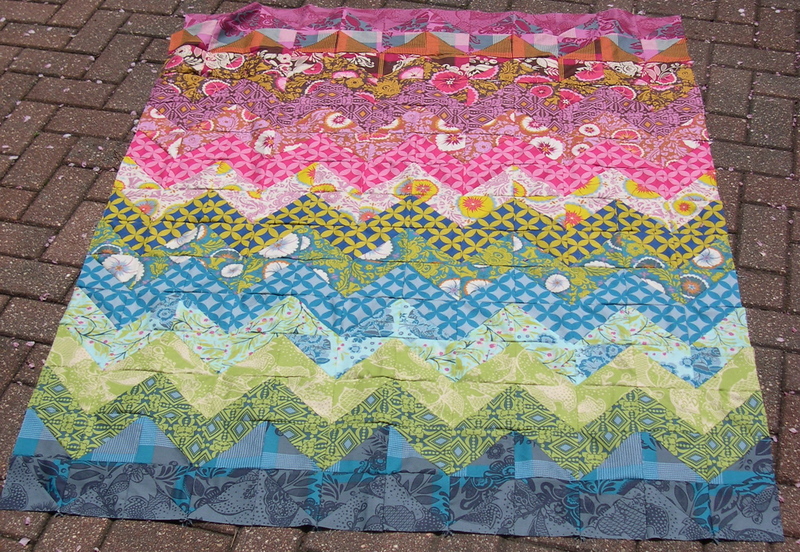 I am doing a zig-zag dance here, and I would love to show you why – the new quilt top I just finished piecing! I was trying to take a picture of this quilt top on the kitchen floor, but Angel was frisky, so I had to take it outside. Much better natural lighting anyway. I love this quilt so much that I want to dance around the house wrapped up in it! I love the Good Folks fabrics, of course, but I really love the way the colors of each stripe blend together, almost giving it movement like a rainbow of waves. I’ve never made a quilt top like this, so it was fun to make something different. I would highly recommend this one. It’s not completely ironed yet, but it measures 51 inches by 64 inches. Here are the two fabrics I’m going to piece together for the backing, mainly because those are the only large pieces I have in my stash from the Good Folks collection. I am excited to do my own machine quilting on this one too! I’m planning to follow the zig and the zag with quilting lines, which should be easy enough for a beginning machine quilter like me. 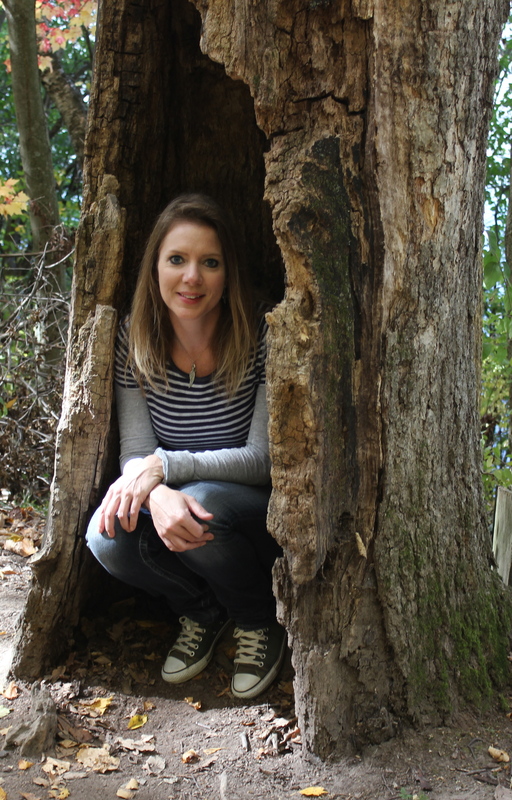 Can’t wait to show you the finished project! Oh my gosh!!! This is beautiful!! I have been loving these fabrics for quite some time, and I especially love them in this quilt pattern! I’m excited to see it after it’s finished! Good luck! Beautiful! 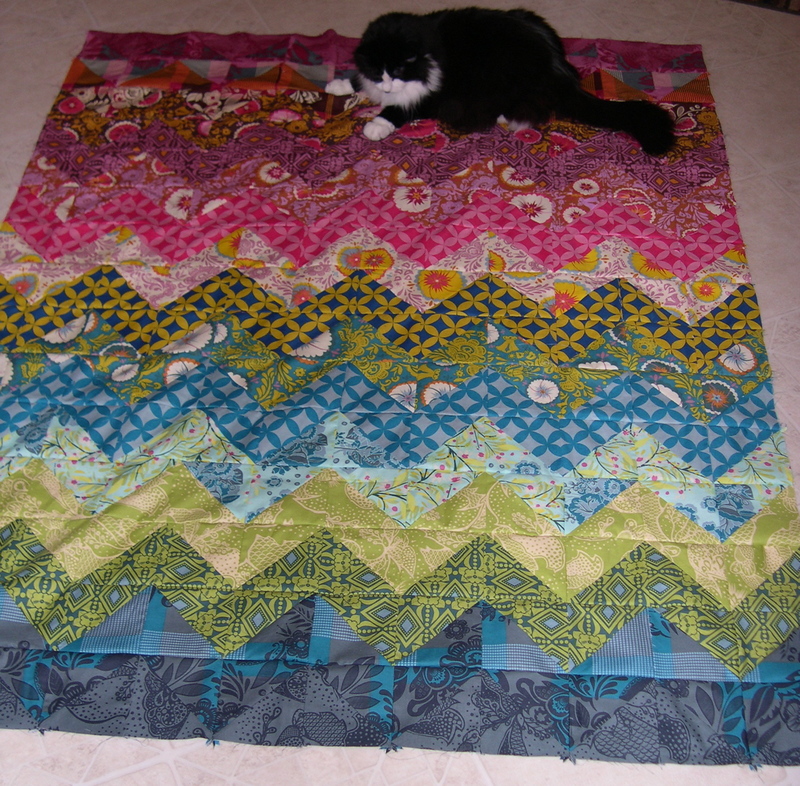 I want to make a zig zag quilt with the Good Folks fabrics, too! I just love the way all the fabrics look together. Your quilt is stunning! I’d love to make a similar one…I’m always so afraid to mix the really bright fabrics. You’ve done a wonderful job…the quilt is striking and yet still easy on the eyes! You’re right, the way the colors blend give the quilt movement, it’s so pretty. It seems to almost reflect light. I love it! Very nice! I love the way you placed the colors! Love those zig-zags, Terri. Looks fabbity! Thank you so much for showing this; I’m working on a long sundress that incorporates this pattern in the lower half of the skirt and this is so encouraging! Of course, AMH and her dress inspire me also-see, you are “up there” with the designers! A side note. . .what a cute kitty! Just gorgeous! I love how the colours works so well together for this design. Your quilt is very pretty love all the colours. Great job. I love it! It came out great! And by the way, I have a kitty that could almost be Angel’s twin, and she does the same thing to me! Very, very pretty! I love zig zag quilts and your fabric choices for this one are great! Its beautiful. I love the zig zag pattern. And of course Good Folks is one of my favorites. Great job!